The latest cold snap has resulted in Mae Hong Son authorities distributing blankets and warm clothes to hill tribes people in the mountains as temperatures drop to 4 C at night. The Hmong in Tambon Huaypong in Mae Hong Son received blankets and thick clothing from District Chief Officer Prasert Osathaphan and other officials on March 29. Anant Laolue, 22 said it was cold for three consecutive days, especially at night; the temperature was as low as 4-5 C and they had to warm themselves with fire, “We have never touched with this kind of weather, it was cloudy the whole day with cold wind,” he remarked. In Chiang Mai, Om Koi residents have seen cattle die from the cold weather with temperatures reaching 7 C and Doi Inthanon recorded a low of 5 C on the morning of March 29. Torrential rains continue in the South with the Royal Thai Navy evacuating stranded tourists from Koh Tao and Koh Phangan and 9 confirmed deaths due to the heavy rains, flooding and landslides over the past 5 days. The Thai Meteorological Department predicts a slight warming trend in the North from the 1st of April while heavy scattered thundershowers are predicted across the South but the rain is expected to decrease. 10 Provincial Chambers of Commerce across the North have invited the general public to join them in donating money and items to help their neighbors in Myanmar, hit by a 6.8 earthquake on the night of March 24. The Committee of the Economic Quadrangle Project and 10 Provincial Chambers in the North have conducted a survey of the damage caused by the earthquake that hit Myanmar’s Shan State’s, Tachilek Province to estimate the cost of damage. They found that people were suffering hardship from the effects of the earthquake so they set up donation program to aid the survivors. 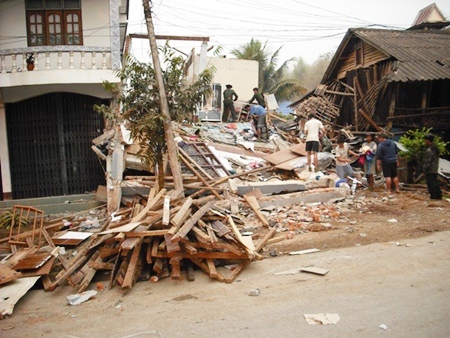 Many relief organizations have helped the quake- hit areas in Tachilek, Tarlay, Nayong, and Maung Lin, and Mae Sai and Chiang Saen in Chiang Rai of the northern Thailand. The earthquake is considered a major disaster for Myanmar with more than 130 people dead and more than 230 injured. It also caused one death and 18 injuries in Northern Thailand. Pattana Sithisombat, the Committee Chairman of the Economic Quadrangle Project and 10 provincial chamber of commence in the North, said Myanmar is a good neighboring country that borders Thailand has long time close relations with Chiang Rai. He said donations could be made through the Committee Project at Thai Military Bank’s Pahoyothin road, Muang District, Chiang Rai No 462-2-10622-9 savings account and then pay in slip could be faxed to 053 - 895255 . Additionally, donation boxes for needed items have been set up at the Chiang Rai Chamber of Commerce offices at 153 Moo 6 Ban Pakluay, Tambon Sansai, Muang district, Chiang Rai 57000 Tel (053) 700330 and fax (053) 774880. 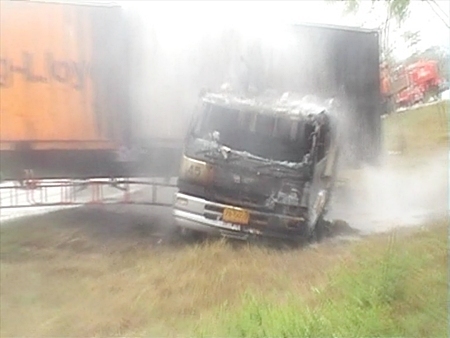 An 18 wheel truck caught fire on the Lampang Highway. On March 29, police in Sobprab district, Lampang rushed out to scene of a road accident where an 18 wheel truck and trailer lost control and plunged off the side of the road into the ditch and burst into flames. The accident occurred on the Superhighway Tak-Lampang road in Ban Mae Kua, firefighters managed to bring the blaze under control although NGV gas leaked from the gas tanks installed behind the driver’s seat. Police assume that the driver lost control on the slippery roads, but he had fled the scene after the accident. A Pai man was shot dead by police after he was stopped by authorities acting on a drug tip on March 28 in Pai District. The combined forces of the Mae Hong Son Provincial investigative police, military officers, Border Patrol Police, and Pai police were on patrol in Ban Mai Yapo in Pai District after receiving a tip off that drug smuggling was occurring in the village. The man, Somboon Bowornsukan, 31 and a resident of Ban Mai Yapo in Pai, opened fire on the police after they stopped to search. The police returned fire, killing the man instantly. A search yielded 500 yabaa tablets and some heroin. that struck Myanmar and Northern Thailand. At least 74 people were reported dead and more than 100 injured in Myanmar from the powerful 6.8 earthquake that struck on the night of March 24, according to reports from Myanmar government radio and television stations. Felt as far away as Bangkok and Hanoi, the quake that struck Myanmar saw the towns of Tarlay, Tachileik and nearby villages in Burma's Shan state seem to be the hardest hit. The station reported that more than 70 bodies were found while some roads were cut off and hundreds of homes were severely damaged or destroyed in the quake. The government has sent search and rescue teams to the areas near the epicenter to aid survivors. Homes collapsed and many buildings damaged from the earthquake that has seen a death toll of at least 74 in Myanmar and 1 in Thailand. Some roads were impassable forcing rescue teams to walk in and carry supplies to reach hard hit villages. More than 400 temples, houses and 9 government buildings including a hospital were reportedly damaged in Tarlay town near the epicenter. The towns of Tarlay, Tachileik and nearby villages in Burma's Shan state appear to have been most severely affected from the earthquake. Chris Herink, Burmese country director for the charity World Vision said there were reports that the number of people killed had increased. "The latest unconfirmed number is 140 so it is a worrying trend definitely," he said. Mae Hong Son Governor Kamthorn Thavornsatit said that buildings, historical sites and temples were not seriously damaged by the earthquake which was just located about 350 kilometers from the town. Many Northern provinces like Chiang Rai and Nan reported severe damage to buildings, temples and historical sites with the famous four pagodas of Chiang Saen in Chiang Rai seeing damage including Chedi Luang, where its three-meter long pinnacle crashed to the ground, AFP news agency reported. Chiang Rai Governor Somchai Hatyatanti, said that cracks had been reported in some buildings. One woman died in Mae Sai when her house collapsed on her. In Chiang Mai, no major damage was reported although homeowners reported cracks in their walls and residents of tall condo buildings evacuated when the earthquake hit causing the buildings to sway. Aftershocks continued after the quake as minor tremors could be felt around the North. Damage estimates continue to be taken and the death toll may rise as reports filter out of Myanmar. The Chiang Mai Mail would like to offer birthday wishes to Her Royal Highness Princess Ubolratana Rajakanya Sirivadhana Phannavadi. She was born on April 5, 1951, in Lausanne Switzerland and is the eldest daughter of Their Majesties the King and Queen. Most recently, HRH Princess Ubolratana has shown a very keen interest in the way Thailand is being promoted by the TAT. She is also a very devoted leader of young people in the campaign against drugs, and as such has instituted and keenly watches over the To Be Number One project, encouraging family values, music and sport as alternatives to drug use. She has also set up the Khun Poom project to assist autistic children in Thailand named after her son who died in the tsunami disaster of 2004. Chiang Mai honors Earth Hour by turning off all lights at 8:30 PM tonight, Central Airport Plaza, Chiang Mai Zoo and many other companies, organizations and venues will join in by turning off their lights at that time. Earth Hour was started in Sydney, Australia in 2007 when 2.2 million people and more than 2,000 businesses turned off their lights to take a stand against climate change. The idea grew and in March 2009, hundreds of millions of people took part in the third Earth Hour. Over 4000 cities in 88 countries/territories officially switched off. This year sees a record number of countries and territories switching off in a display of unity to call for action in climate change. Around the world at 8:30 PM local time, lights will be switched off. Chiang Mai will join in by switching off as well. Once in the open, stay there until the shaking stops. The greatest danger exists directly outside buildings, at exits and alongside exterior walls. Many of the 120 fatalities from the 1933 Long Beach earthquake occurred when people ran outside of buildings only to be killed by falling debris from collapsing walls.Ground movement during an earthquake is seldom the direct cause of death or injury. Most earthquake-related casualties result from collapsing walls, flying glass, and falling objects. On April 2 The Kingdom of Thailand celebrates the most auspicious occasion of Her Royal Highness Princess Maha Chakri Sirindhorn’s birthday. We at the Chiang Mai Mail join in with our most humble wishes for HRH Princess Maha Chakri Sirindhorn for a long, healthy and happy life. Her Royal Highness Princess Maha Chakri Sirindhorn was born on April 2, 1955, the third child of Their Majesties the King and Queen of Thailand. HRH the Princess studied from kindergarten to high school at Chitralada School in Bangkok. She ranked first in the National School Examinations in the primary level (grade 7) in 1967 and in upper secondary level (grade 12) in 1972. Ranked fourth in the National University Entrance Examination, HRH the Princess enrolled in the Faculty of Arts, Chulalongkorn University and graduated with a Bachelor of Arts degree, first class honor, and a gold medal in History in 1976. She continued her studies in two graduate programs concurrently, obtaining an M.A. in Oriental Epigraphy (Sanskrit and Cambodian) from Silpakorn University in 1978, and an M.A. in Pali and Sanskrit from Chulalongkorn University in 1980. She enrolled in a doctoral program at Srinakharinwirot University (former College of Education) in 1981, and was awarded a doctoral degree in Developmental Education in 1987. The principle of using education as a means for community and social development, which HRH the Princess acquired during her doctoral studies along with her former experiences in the field, has provided her with a solid base for her subsequent involvement in community development activities. In addition to her formal degree programs, HRH the Princess has attended several training courses and workshops to enhance her knowledge and skills in effective integrated development. These subjects include computer, cartography, meteorology, survey and photogrammetry, remote sensing and geographic information system and nutrition. HRH the Princess has acquired first-hand experiences in working on development projects initiated by Their Majesties the King and Queen. These projects involve a number of diversified fields including health and hygiene, education, water resource development, agriculture and cottage industry by regularly accompanying Their Majesties on visits to remote areas since the age of sixteen. From these experiences, HRH the Princess has developed special interests in agricultural extension to improve school children’s nutritional conditions; supports education from pre-school to tertiary levels; and mother and child care. She has also concentrated on helping the handicapped, especially in using information technology (IT) to develop independent living and learning skills. HRH the Princess runs several philanthropic organizations and foundations. She has been Executive Vice President of the Thai Red Cross Society since 1977; Executive Chairman of the Chaipattana Foundation (in charge of His Majesty’s development and environmental preservation projects), Ananda Mahidol Foundation (to promote higher education), the King Rama II Foundation (to conserve and promote Thai Culture); President of the Sai Jai Thai Foundation (to support disabled veterans), Prince Mahidol Award Foundation (to award prizes annually to members of the international community for outstanding performances in the fields of medicine and public health); and Adviser of the Committee of Thai Junior Encyclopedia Project by Royal Command of H.M. the King. HRH the Princess began her teaching career in 1979 when she started teaching the General Education Program at Chulalongkorn University. A year later, she joined the Department of Law and Social Sciences, in the Academic Division of Chulachomklao Royal Military Academy. Presently she is Director of the Department of History, and has played an active part in revising its curriculum. She also supervises the Thai Music Club at the Academy. Occasionally HRH the Princess gives special lectures at several other institutions and regularly attends academic conferences and seminars both in and outside the country. In addition, HRH the Princess represents Their Majesties in various royal functions. She also presides over ceremonies as well as other social and charity functions all through the year. In 1991, HRH the Princess was awarded the Magsaysay Award for Public Service. HRH the Princess likes to travel around the Kingdom and abroad to obtain knowledge of physical geography and peoples’ varied lifestyles. One of her favorite pastimes is writing articles, poetry and short stories. Proceeds from her written accounts of her overseas travels are the main source of income for the Princess Maha Chakri Sirindhorn Foundation which was set up in 1979 to support needy students in schools, vocational colleges and universities. HRH the Princess loves Thai literature and studies literature of other countries. She enjoys playing classical Thai instruments and practicing Thai classical dancing. She also paints and is keen on sports, including jogging, swimming, biking and trekking - which gives her an opportunity to learn about plants, trees and geographical features of the areas. In addition to her knowledge of Pali, Sanskrit and Cambodian, HRH the Princess is communicative in both English and French and has been learning Chinese, German and Latin. 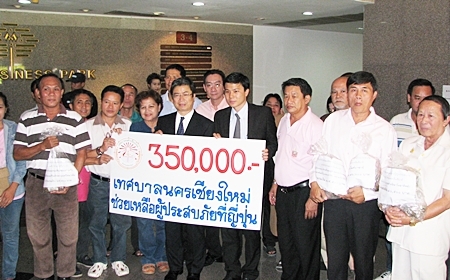 Mayor Tussanai Buranupakorn presents a symbolic check for 350,000 Baht from the people of Chiang Mai to Japanese Consul General Kazuo Shibata on March 22, 2011. Mayor Tussanai Buranupakorn and representatives from various local organizations and temples donated 350,000 baht collected from around the city to present to Japanese Consul General Kazuo Shibata on Tuesday, March 22, 2011 at the Japanese Consulate General on Mahidol Road. He added that the Thai people offered their deepest sympathies to Japan on this terrible disaster. 350,000 baht was collected from various points around the city including the Sunday Walking Street Market, the Night Bazaar, Waroros and temples over the 5 days from March 14 – 19, 2011. A guest book for members of the public to offer their sympathies is located in front of the Japanese Consulate General offices in the Business Park building on Mahidol Road. A minor earthquake shook Pai district in Mae Hong Son on March 21, measuring at 3.1 on the Richter scale. There were no reports of injuries or serious damage according to Adichart Surin, the Director of the Geology Division of the Department of Mineral Resources and Seismology Monitoring Center. The tremor occurred at 6.23 p.m. and the epicenter was at Tambon Wiangnue in Pai. Adichart noted that the high risk provinces for earthquakes are Mae Hong Son, Chiang Mai, Chiang Rai and Phayao in the North. “It is very often that the tremors with seismic centers were found in these provinces because the faults are mostly located in Northern Thailand. 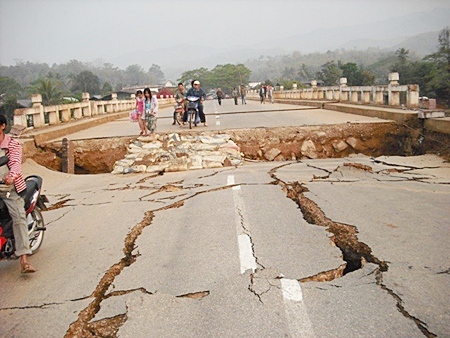 Last July 26 last year, 6 small earthquakes were reported in Pai and residents in Mae Sarieng district and other nearby districts also felt the shaking. A Rak Chiang Mai 51 Group member one of the core leaders of the group surrendered to the police station in Mae Ping on March 21, 2011. He denied all charges and was released on 100,000 baht bail. Phetchawat Wattanapongsirikul fled to another country in January when he was initially charged with violating national security and damaging government buildings during the political riots last year. He surrendered to Pol Lt Col Ithirat Sanpanya of the Mae Ping Police Station, after an arrest warrant was issued for him in January. At the police station, Phetchawat was met by about 100 red shirt supporters, including Phrakru Suthepsithikhun, the abbot of Wat Sriboonruang. Phetchawat was accused of invading and destroying government offices, insulting the former Provincial Police Region 5 commissioner Pol Lt Gen Somkid Boonthanom. After his release on bail he said he will fight against the charges, adding that he surrendered to the authorities because he was asked by ‘Pu Lak PuYai’ (influential and senior persons) who suggested it to him since the general elections are expected soon. He added that he was a member of Puea Thai Party and that he plans to help them campaign in the future. Consul General for Japan, Kazuo Shibata, standing right, is seen here presenting the grant for a new training center for the disabled to Dr. Thaweesak Mahachawaroj, Chairman of the Christian Service Foundation (Baptist) in Mae Hong Son. The Government of Japan, under its Grant Assistance for Grassroots Human Security Projects Scheme (GGP), is providing funds amounting to 3,363,200 baht for The Project for Promoting Vocational Training for People with Disabilities in Mae Sariang District, Mae Hong Son Province. 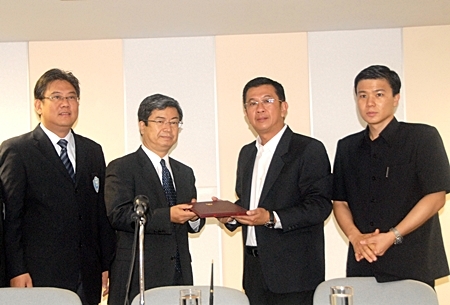 On March 21, 2011, Mr. Kazuo Shibata, Consul-General of Japan in Chiang Mai, and Dr. Thaweesak Mahachawaroj, Chairman of the Christian Service Foundation (Baptist), jointly signed the funding contract for the project at the Consulate-General of Japan in Chiang Mai. Mae Sariang and neighboring districts; Sop Moei, Mae La Noi, and Khun Yuam, are mountainous with many residents from ethnic minorities. In these four districts, about 2,240 residents are registered as people with disabilities. For many of them, it is difficult to find work due to limited opportunities to receive rehabilitation, education, and vocational training as well as language differences and social bias against them. As a result, they tend to depend on their families economically. Therefore, it is necessary to empower them by providing vocational training and work opportunities according to their type and degree of disabilities, and to generate additional income to improve their quality of life. The Christian Service Foundation (Baptist), which promote education and manages hospitals and welfare centers established for the underprivileged, has made one of its properties at Mae Sariang District available for activities conducted by a non-profit organization, the Christian Center for the Development of People with Disabilities. The Christian Center, whose target areas are Mae Sariang, Sop Moei, Mae La Noi, and Khun Yuam Districts, provides welfare services for people with disabilities in remote mountainous areas, school preparation programs and special education for children with disabilities, vocational training in handicrafts for people with disabilities, and support for income generating activities by their families. However, one of the buildings for the activities is wooden and more than 50-years-old, and is too decrepit and structurally unsuitable for such activities. In response to a request from the Foundation, the Government of Japan has decided to provide funds for the construction of a center to promote vocational training for people with disabilities. It will include two vocational training and work rooms for people with disabilities as well as a seminar room to be utilized for income generating activities by family members and awareness raising activities for community members. In addition, since a dormitory room and a toilet and shower room for the disabled will be prepared, it will make the center accessible for those living in remote mountainous areas. It is expected that vocational training and other activities will be conducted by the Christian Center more efficiently and effectively, helping people with disabilities and their families in Maesariang and neighboring districts to generate additional income and resulting in an improvement in the quality of life. For more information, please contact Mr. Sato, Consul, or Ms. Hoshii, Ms. Hamaguchi, Coordinators for GGP. Consulate-General of Japan in Chiang Mai. 053-203-367. PAO President Boonlert Buranupakorn and Chiang Mai Mayor Tussanai Buranupakorn offer their condolences to Kazuo Shibata, Consul General for Japan in Chiang Mai. Chiang Mai City and Provincial officials sent condolence messages to Japan on behalf of the people of Chiang Mai. Japan faces the worst natural disaster in its history after a 9.0 magnitude earthquake triggered tsunami waves that wiped out much of the northern coastal areas and triggered major crises at a nuclear power plant. Boonlert Buranupakorn, President of Chiang Mai Provincial Administrative Organization (PAO) and Chiang Mai Mayor Tussanai Buranupakorn offered condolences to the Japanese people in this terrible disaster in a meeting with Japanese Consul General Kazuo Shibata, on Monday, March 14, at the Japanese Consulate General in Chiang Mai. Donation centers have been set up in front of the Chiang Mai PAO and Municipal offices so that residents can help aid victims of the earthquake and tsunami. Cash donations through the Japan Tsunami Victims Relief Center, Chiang Mai can be made at Krung Thai Bank, Kuangsing Branch Account number 547-038-9677. JJ market organizers of the Japanese Festival to be held on March 19 at 6 p.m. will take donations for the victims as well as run fund raising activities along side the performances of Japanese art, music and shops offering Japanese goods. Chiang Mai Governor ML Panadda Diskul has donated items for auction as have other TV and film starts. Proceeds from the auction will go to helping survivors in Japan. For information, please contact 053-231517, 053-231520-5 ext 108, 083-208-7592, 086-9174331, 084-0405821or [email protected], [email protected], [email protected], www.jjchiangmai.com. Governor M.L. Panadda Diskul is joined by U.S. Consul General Susan Stevenson, Mayor Tussanai Buranupakorn and Rev. Dr. Pradit Takernrangsarit, President of Payap University, Martin Venzky-Stalling and other CMCC committee members. At a meeting held at Chiang Mai University on Friday, March 18, 2011 saw the Chiang Mai Creative City (CMCC) initiative receive the support of Chiang Mai Governor ML Panadda Diskul and the announcement that the Ministry of Culture supports Chiang Mai’s initiative to apply for UNESCO’s Creative City designation gave the burgeoning movement a good push forward. The meeting, chaired by the CMCC Chair Asst. Prof. Dr. Nat Vorayut saw Mayor Tussanai Buranupakorn and U. S. Consul General Susan Stevenson join the panel with committee member Martin Venzky-Stalling and Rev. Dr. Pradit Takernrangsarit, President of Payap University. In addition to the revelation that the Ministry of Culture supported a bid by Chiang Mai for a folk arts and crafts designation in the UNESCO Creative Cities Network was that they also plan to promote Pattaya in the field of Film and Phuket in Gastronomy. The UNESCO Creative Cities Network was instituted in 2005 and now encompasses 25 cities in categories including, design, media arts, music, and literature in addition to film, gastronomy and folk arts. The program aims to celebrate and maintain cultural diversity by allowing cities to promote their local heritage in a sustainable way that focuses on not just their past but their way forward and to adapt and harness the proliferation of technology and social development to further a city’s product of excellence. Governor M.L. Panadda Diskul remarked that he had been following the proceedings of the CMCC with great interest and enthusiasm. 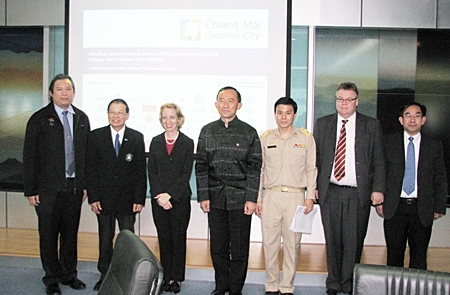 After a discussion by Martin Venzky-Stalling iterating the strengths and weaknesses of Chiang Mai, U.S. Consul General Susan Stevenson noted the U.S. has been a supportive force in the Creative Economy process, suggested that the Design category would allow Chiang Mai to grow and diversify and bring more diversity to the economy. Rev. Dr. Pradit felt that Chiang Mai should be more daring and try for Design. Governor M.L. Panadda Diskul agreed, however he felt that Chiang Mai should “focus on the things we can do for certain.” He suggested that Chiang Mai might find application for the Folk Arts category more successful and that achievement of the Folk Arts designation would see Design flow automatically. Chiang Mai University’s Faculty of Art, Media and Technology has been advising the Ministry of Culture and will offer their research on the subject at the next month. 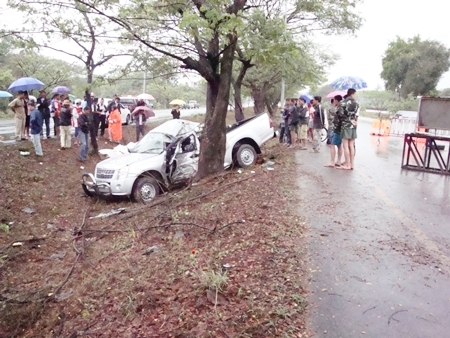 The Isuzu pickup truck was totaled and resulted in the deaths of 5 men when it hit a tree in Lampang. 5 men were killed when the pickup truck they were riding in slammed into a tree after returning from an engagement party. Police suspect that the driver was drunk and was driving at a high speed on the rain slick roads when he lost control on the Paholyothin Road in Sobrpap in Lampang on March 17. The driver, Sri Khamwan, 53, a resident of Tambon Maekua and a passenger were seriously injured in the accident and sent to Lampang Hospital. The injured passenger died on the way to the hospital while 4 men, all also residents of Maaekua were found dead at the scene. Police suspect that Sri was drunk and lost control of the car. Phayao also saw a deadly accident on March 14, where four women were killed when a tour bus carrying passengers to Chiang Rai overturned after swerving to avoid a motorcycle. Police were called to the scene in Maeka in Phayao after the Chokrunthawee Tour bus on the Phuket-Bangkok-Chiang Rai router overturned around 4 a.m. The bus driver Kongphan Kanharuang, 45, told the police that he drove the bus with 30 passengers on board leaving Bangkok and heading for Chiang Rai when a motorcycle cut in front of the bus and as he swerved to avoid the motorcycle he lost control and the bus overturned, killing the four women. 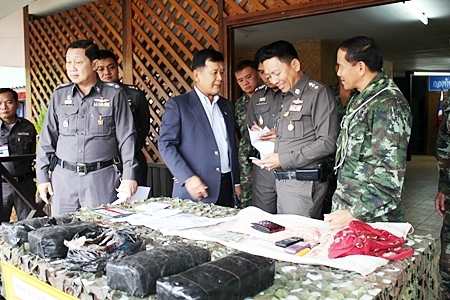 Two Myanmar nationals were arrested with 12.8 kg of opium in Mae Hong Son. Soldiers arrested two suspects with a haul of raw opium worth one million baht on March 16 at the Ban Nampiengdin Border pass in Phabong in Mae Hong Son. Soldiers discovered a man and woman smuggling raw opium from Kayah state in Myanmar into Thailand with the intent of refining it into heroin. On March 17, Thanin Supasaen, Deputy Governor of Mae Hong Son, Col. Boonyuen Inkwang, Deputy Commander of the Regiment, and Pol. Maj. Gen Kasemsant Bunyakarn, the commander of Mae Hong Son Provincial Police announced that two suspects had been arrested with 12.8 kg of raw opium worth 1,200,000 million baht. The two suspects were identified as Mr. Plae, surname unknown, 43, a Tai Yai with Myanmar nationality, who lives in Tambon Mokchampae, Mae Hong Son, and Mrs. Jaeng (surname unknown), 24, a Myanmar national who lives in Tambon Phabong, Mae Hong Son. They were arrested on the road to Mae Hong Son on their way to deliver the drugs for refinement. They confessed that they worked on a construction site in Mae Hong Son and were hired to smuggle the opium to the meeting point for 160,000 Baht. They were detained at the Ban Nampiengdin Police Station for further questioning and were accused of possessing the drugs with intent to sell. The Ministry of Foreign Affairs for New Zealand issued a health advisory on March 17, 2011. “We are aware of 6 recent unexplained deaths in Chiang Mai, including of one New Zealander. The cause of death is unknown, and the results to date are inconclusive although there has been speculative media comment linking the deaths to local food markets. It is recommended that travellers take general preventative health measures including paying attention to personal hygiene, eating only hot food and drinking clean water. Those who experience severe sudden multiple vomiting with or without diarrhoea, should seek medical attention immediately. Chiang Mai Governor reported at a press conference earlier this month that authorities were sending samples overseas for testing. Recent reports indicate that Sarah Carter, the New Zealand girl, died from the echovirus. However, since then the Department of Disease Control has reported that Sarah Carter, American Soraya Vorster, 33 and an unnamed French woman died around the same time but were staying at different hotels. An elderly British couple died at the same hotel as Sarah Carter but authorities have concluded it was a coincidence. The death of Thai guide Waraporn Yinghasawanont remains unexplained. The National Astronomical Research Institute of Thailand (Public Organization) based in Chiang Mai reported that the full moon on the evening of March will be a super moon, when the moon makes its closest approach to Earth in 18 years. The moon will be the biggest on the night of March 19 or early morning of March 20, around 2 a.m. when the orbit of the moon takes it within 356,577 kilometers from earth making the moon appear about 2-3 percent larger. 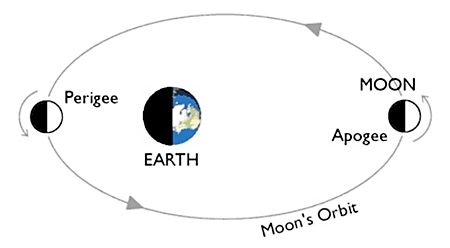 The average distance between the Earth and the moon is about 382.900 kms as the moon moves in orbit around the earth from West to East, the nearest point is called the perigee and the furthest the apogee. The last big full moon was seen on December 12, 2008. Scientists point out that this natural phenomenon, which occurs regularly, is not cause for concern. The Government of Japan, under its Grant Assistance for Grassroots Human Security Projects Scheme (GGP), is providing funds amounting to 3,440,700 baht for “The Project for the Construction of a Training Center for Ethnic Minorities in Maechan District, Chiang Rai Province”. 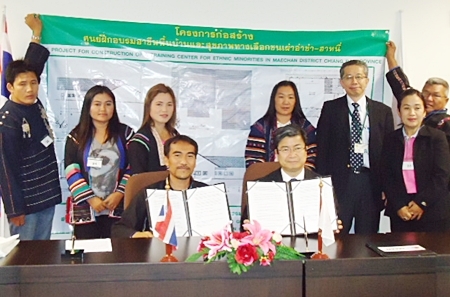 On March 15, 2011, Mr. Kazuo Shibata, Consul-General of Japan in Chiang Mai, and Mr. Kraisit Sitthichodok, Director of Association for Akha Education and Culture in Thailand, jointly signed the funding contract for the project at the Consulate-General of Japan in Chiang Mai. Many Akha people living in Northern Thailand, especially Chiang Rai，Chiang Mai，and Lamphang Provinces, have limited opportunities to gain occupational skills necessary to improve their income. In addition, the introduction of new ways of life to their communities has made it difficult for them to sustain their ethnic customs and culture. At the same time, they are facing new issues relevant to such changes, such as health problems caused by agricultural chemicals, the rise of life-style related diseases, devastation of forests, decline of natural resources and human rights issues arising from economic and social differences. Therefore, they increasingly feel it necessary to learn indigenous occupational skills and alternative health management so that they can have more options for occupations in mountainous areas, improves their income, and reduces problems involving health, the environment and human rights. The Association for Akha Education and Culture in Thailand, which mainly targets Akha people and communities in Chiang Rai, Chiang Mai, Lampang, Phayao, Phrae, Tak, and Phetchabun Provinces, has provided activities for young people, training and seminars on occupational skills and human rights for women and elderly groups, and environmental protection including alternative energy and waste treatment. Moreover, through the network with Akha groups in Laos, China and Myanmar, the Association has also conducted seminars on health management, education for children, and prevention of human trafficking. However, due to the limitation of existing facilities for such activities, a new building is required to implement training and seminars more effectively and efficiently. Consulate-General of Japan in Chiang Mai. 053-203-367.